Eps 61 - Zamasu's Ambition - The Awful "Zero Mortal Plan" Is Revealed ! Eps 62 - I'll Protect the World! Trunks' Furious Super Power Explodes!! Eps 63 - Don't Disrespect Saiyan Cells! Vegeta's Heroic Battle Begins!! Eps 64 - Revere Him! Praise Him! Fusion Zamasu's Explosive Birth!! Eps 66 - The Climactic Battle! The Miraculous Power of a Relentless Warrior! Eps 68 - Come Forth, Shenron! Whose Wish Will Be Granted?! Eps 69 - Goku vs Arale! A Ridiculous Battle Will End The Earth?! Eps 70 - Champa's Challenge! This Time We Fight With Baseball! Eps 72 - Will There Be A Counterattack?! The Invisible Killing Strike!! 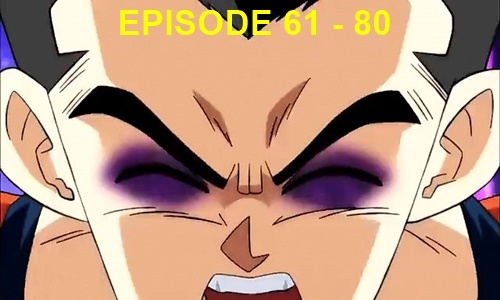 Eps 73 - Gohan's Misfortune! An Unexpected Great Saiyaman Movie?! Eps 74 - For the Ones He Loves! The Unbeatable Great Saiyaman!! Eps 76 - Defeat These Terrifying Enemies! Krillin's Fighting Spirit Returns! Eps 77 - Let's Do It, Zen-Oh Sama! The All-Universe Martial Arts Tournament!! Eps 79 - Universe 9's Basil The Kicker VS Universe 7's Majin Buu!! Eps 80 - Awaken Your Sleeping Battle Spirit! Son Gohan's Fight! !